John Monash Science School is a state 'selective' school catering for 690 students across Yr10-12. Selective means that they selects on specific criteria, in their case, passion for Science, Maths and Technology. Last year they had over 3x the number of students apply, as were spaces in Yr 10. One student I spoke to travelled 2 hrs each way to school - 2 trains and 2 buses each way! The school is located on John Monash University Campus, and they have a close partnership with the Science Faculty at the university. The buildings are a complex of spacious, open plan areas with double sized labs, catering for 2 classes ( 50 students) at a time. Smaller tutorial rooms are available and 'bridge' areas are where non lab specific classes take place - with also up to 50 students operate in a team teaching environment. 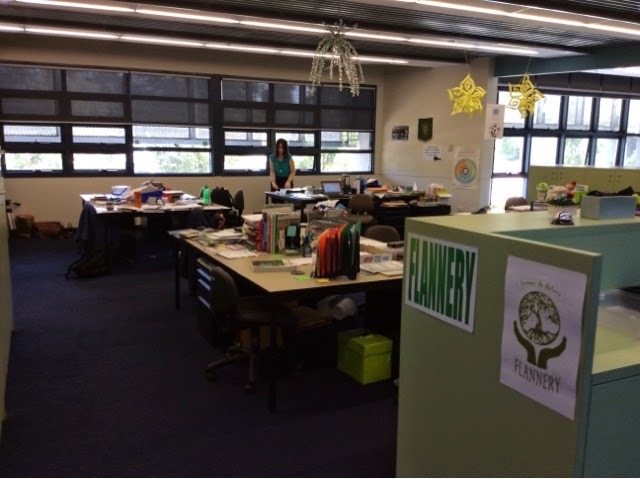 The staff workspaces are house based and cross curricular - tied into the pastoral care system. All of the houses are named after working scientists, all of whom, have now visited the school. 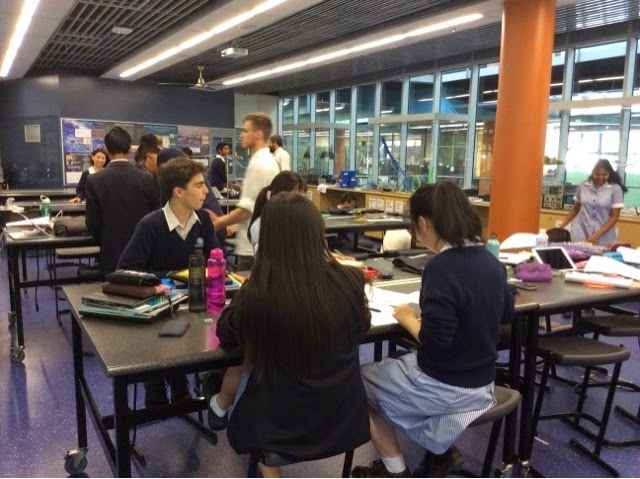 While I have heard a lot about the high stakes ATAR exam system in Yr 12 (our Yr 13) the upside of only one year of a national examination system is evident at JMSS, allowing students to follow their passion, to work like a scientist. 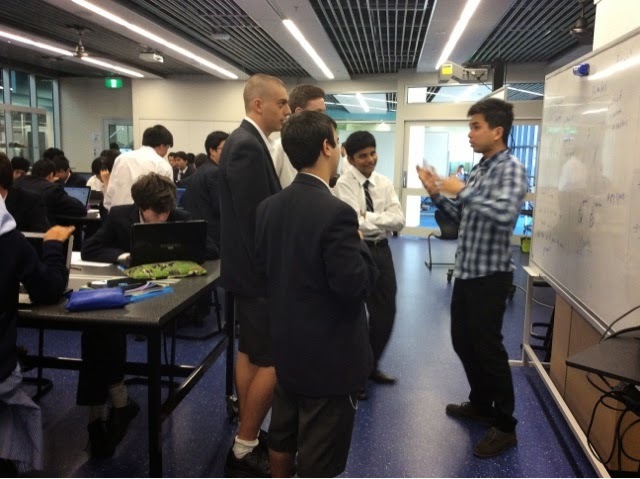 All Yr 10 students select elective units from 'emerging sciences.' These include such topics as nanotechnology, bioinformatics (genome coding), quarks to quasars (astro and quantum physics) .... As well, all humanities are on offer and 42 languages are taught through distance education. 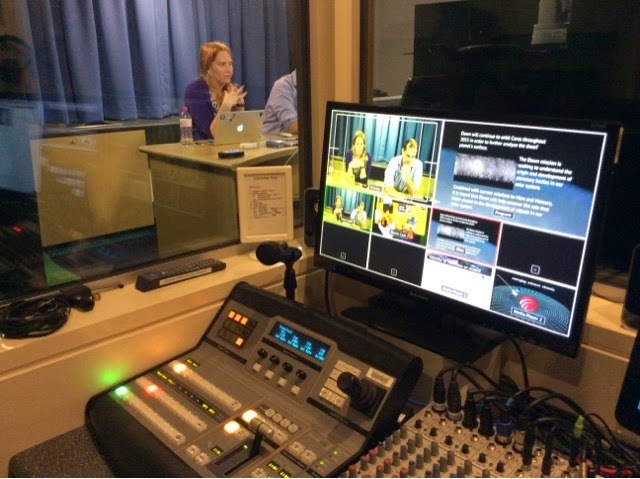 The school also delivers curriculum through an online live platform. Twice a week, 2 teachers deliver an emerging science elective to 150 students state wide. Makes our national correspondence school look worse than obsolete!! What the online students see. The teaching space and technical support for the online platform. 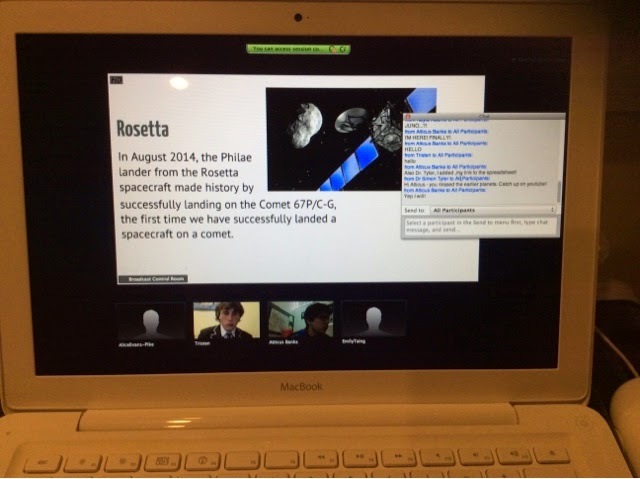 The online lessons count as part of each teachers allocation. Team teaching is the norm at JMSS - teachers are allocated classes and spaces - they might suggest who they want to work with, but the timetable fits them in. 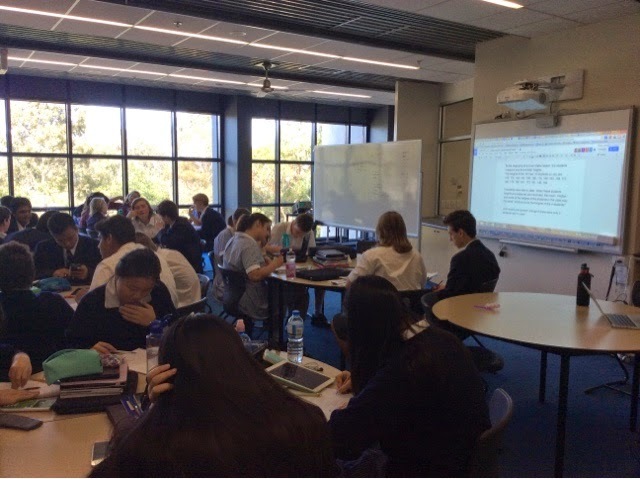 I sat in on a Yr 10 Specialist Maths session with 50 kids and 2 teachers. It was interesting to watch the natural flow of the teachers. If I had mapped their movements it would have looked like a star or a petal - circulating out as individuals and then coming together regularly to confer ascot when to move the students on. Team teaching has lots of positives -support, learning from each other, deprivatisation of practice, shared workload etc. However, if the teachers are not comparable, it can be like an 'arranged marriage'. Things to think about when we are planning our team teaching work. Technology is fully integrated into all aspects of learning. The school is BYOD multiple devices - the main device must have a keyboard and a second device for fiilming, photographing and uploading images for assessments. 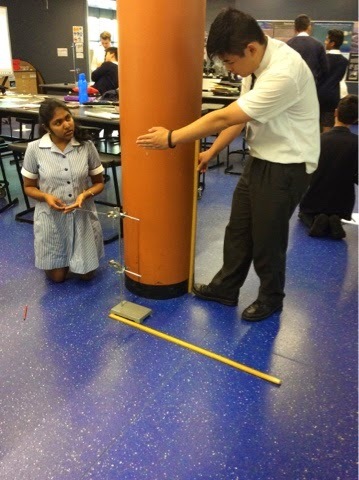 Yr 13 Physics were carrying out an investigation called 'Tarzan's Swing' - groups were filming the swing of the pendulum and the trajectory of the weight, this was then being uploaded into an app that measured something I did not understand!! 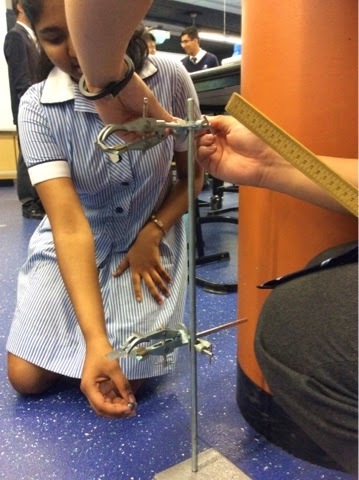 The Yr 10 Maths classes I sat in in were working collaboratively on a problem solving activity. 50 students were in the space, all discussing the equation/problem. After a couple of check progress whole discussions, the students could carry on with the data set problem, or their individual work - which was all on Google Classroom. 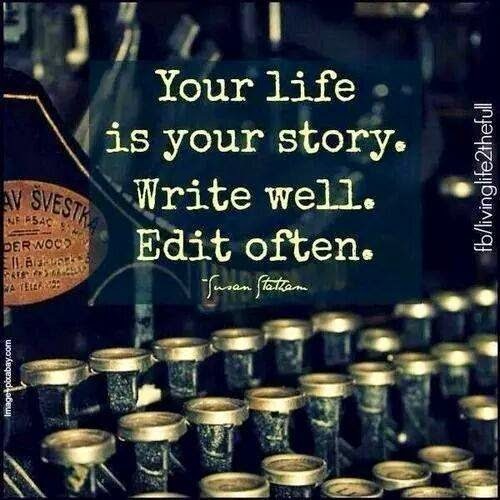 Self-paced and personalised. 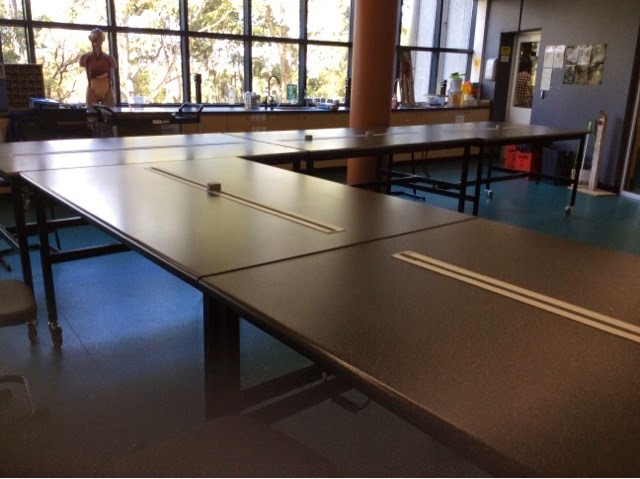 As a science specialist school, workable lab spaces are essential. An interesting design feature were the powered tables - the bar in the middle us activated when the plugs are rotated, cutting down the issue of cables everywhere. Max, the senior lab tech, also talked about the need for draining racks, fume cupboards in technician spaces, and the issue of having floors power boxes in spaces that could potentially flood. At JMSS all the labs could potentially be senior Chem labs, but not all had access to gas. 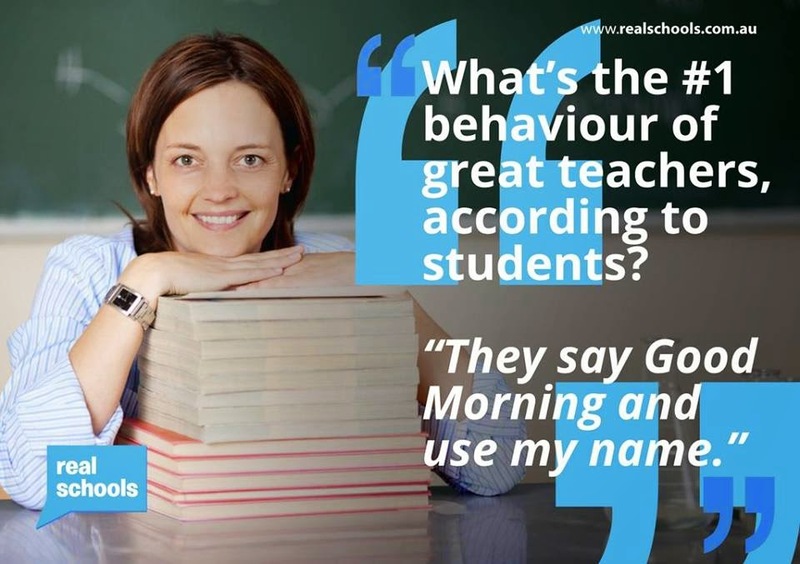 Like a number of the schools I have seen, the 'Learning Coach' model (or a variation of) forms a large part of the pastoral care system. 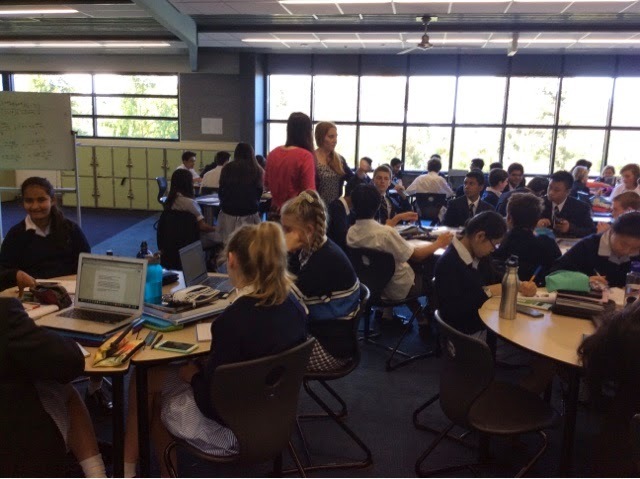 Teacher mentors track academic progress and a Empowerment Team of students and a range of staff, ensure all students integrate smoothly into the JMSS way. The pedagogy is based around a design thinking framework - where reflection is split into a focus on content (demonstrate) and on learning skills (reflection). All lessons start with an 'engager' and follow a clear cycle. Learning objectives are clear and students have time to construct and demonstrate their understanding. The school has been 'cloud based' since its inception with very few installed programmes. The students have high speed unfiltered access. Looked like a fabulous place to be science loving student. Thanks Chris and staff who spent time talking with me.